Arriving at Kendal Calling late afternoon on Thursday; along another swervy Cumbrian road, past lazy sheep grazing alongside the path, we encounter willing stewards and a very busy car park and after a good ten minute walk, laiden with rucksacks, we make it to the campsite. We set up just off the Wolf Woods, the rowdy campsite nearest to the arena. Tent pegs are battered into the tough, rocky ground with help from a friendly neighbour’s hammer, and we set about exploring. It’s clear from the offset that the festival is already in full swing, drawing a youthful crowd, and a family friendly atmosphere, we’re surrounded by short shorts and tops off, glitter and garlands, and many a merry, sunburnt reveller in sight. Passing the Village Green, home to the welfare and information points, the childrens’ entertainment area, main stage and Chai Wallah, and suss out the latest addition to the festival site, The Valley of the Beats, which houses dance music all afternoon and the late night scene. It’s refreshing to find the various shops and stalls scattered around, rather than confined to one specific area, and there are compost loos, charging points, and all the other necessary components for a fun and safe weekend. 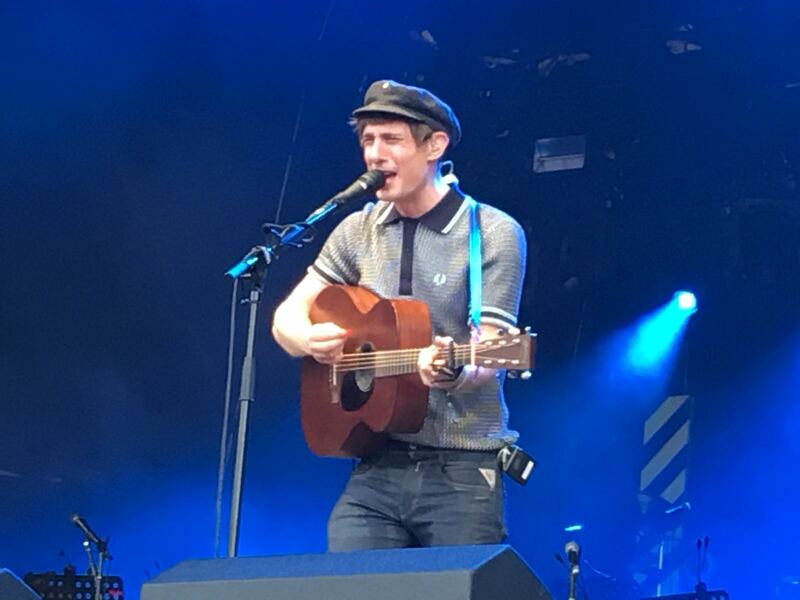 Our first act comes in the form of Scottish working class crumpet Gerry Cinnamon, at the main stage. The crowd that gathers before he comes on chants his name and despite a growing mosh pit it's good vibes all round. With his down to earth demeanor, cheeky smile and catchy lyrics, his devoted fans sing along with great gusto, saltire flags are flying, as he belts out his hits Belter, Discoland and even treats us to a brand new tune, by the end of which people are joining in on the chorus. He is a man on his way up, and very much in love with his job, and the crowd make sure to let him know he’s appreciated. It’s a beautiful start to an incredible weekend. We explore the arena some more, enjoying the variety of food stalls, and shops, popping in at the Psychedelic Dip stall to get some UV paint body art, and we admire the scattered lay out of the site; in between the beautiful giant old trees and hilly landscape there are hammocks, funny sign posts, and loads of ice cream vans dotted around the place. There’s a good variety of bars from the Russian Vodka bar to the Strongbow bar, Portobello Gin bar and a real ale tent, to name a few. Security are fairly strict, sometimes causing quite large queues to get into the arena, as no alcohol is allowed in from outside areas, so you have to be prepared to spend some money any time you’re away from the campsite. Soon a lively Craig Charles took to the stage, getting us all grooving and bouncing around to some excellent soulful and funky beats. We have dinner of pesto macaroni cheese, sat under the twinkle of a giant disco ball mounted in a frame, and as dusk falls people stop to dance and pose for photographs underneath it; it’s a wonderful spot to observe, meet and mingle for the rest of the evening. 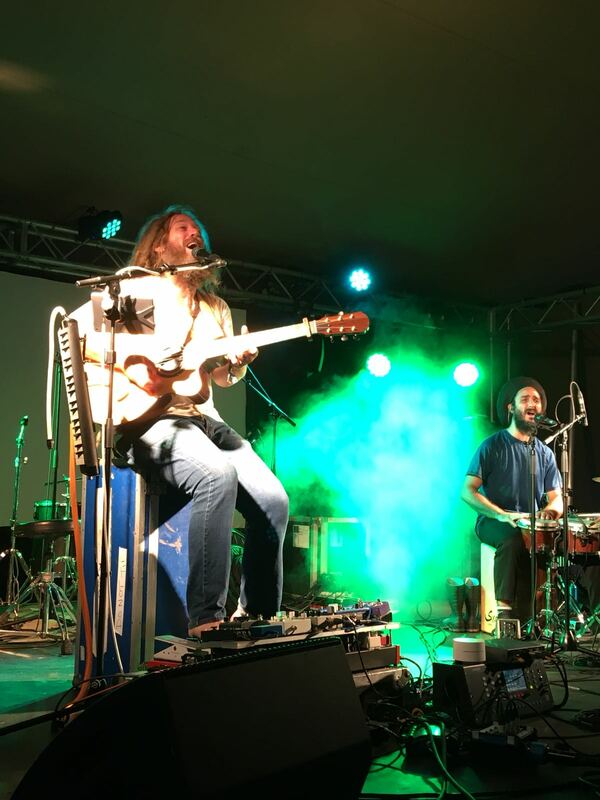 Friday brings us new neighbours at the campsite and after some bonding and a glittering session we head to watch Plastic Mermaids at the main stage, whose goosebump inducing harmonies and psychedelic indie music goes down very well with a shoal of merry festival goers. Afterwards we explore Lost Eden, the woodland area, and The March of the Elephants, a parade of stilt walkers, lead us down past more bars and fairground rides before we catch Bis at the intimate venue, Tim Peaks Diner. Saving their biggest hits until last, their punchy, poppy Glaswegian punk served at ground level, goes down well in the sweaty log cabin. The bar staff even join in too! After a go on the waltzers and big wheel we have some down time back at the camp, soaking up the last of the daylight. Later on, James drew the biggest crowd of the festival yet, at the main stage, nostalgia hangs in the air as the audience sings along to almost every song. The aromatic Chai Wallah tent played host to the massively crowd pleasing Dub Pistols who brought their A-game and got us all set up for the mucky weekend ahead! With the weather turning we paid no heed to the drizzle as we headed to Lost Eden to enjoy interactive sculptures such as the Illumaphonium, a giant lit up xylophone with a backbeat to chime along to, as well as fire installations, and many more trees to hug. After boogying on some benches at the silent disco in the woods we enjoyed refreshing mojitos, and made our way to the Red Stars ‘secret’ compound for some covert raving. Back at camp we partied til the early hours and came across singer-songwriter Liv McDougall, who wowed us with her awe inspiring vocals and wisdom beyond her years; just one of the many beautiful souls we happened upon over the weekend! On Saturday Fun Lovin’ Criminals took to the main stage to the song ‘New York, New York’; frontman Huey oozing all the charisma and cool they’ve maintained over their years in the business. They played to a smaller crowd, many huddling under the trees, but gave it their all regardless. The Vodka Mule bar provided some welcome shelter and a brightly lit, cheery spot for drinks and socialising while the site turned into a mud bath before our eyes. The rain was pretty relentless for much of the weekend, cue the adorning of plastic ponchos, welly boots and lots of sliding around. On Saturday night the Glow Tent was the place to be, for the Hospitality Takeover! Etherwood with Tempza played energetic crowd pleasers, and liquid drum and bass to the aptly named, glowing tent; it certainly warmed us up, before Dub Phizix and Strategy brought some fat bass and dubby beats and some excellent MC-ing which kept the crowd hyped up. Next was a DJ set from London Elektricity, who played some of his own drum and bass hits, old and new, before we admitted defeat and headed for some much needed sleep. Sunday, and some of the campsite starts to look a bit sparse, as the weather and slushy terrain has just proved a little too much for some. We had a lazy start, to conserve our energy, and after some food and a freshen up we headed to the mainstage for the feisty Lady Leshur, who, along with her amazing back up dancers, revved up the crowd with her garage beats and MCing. 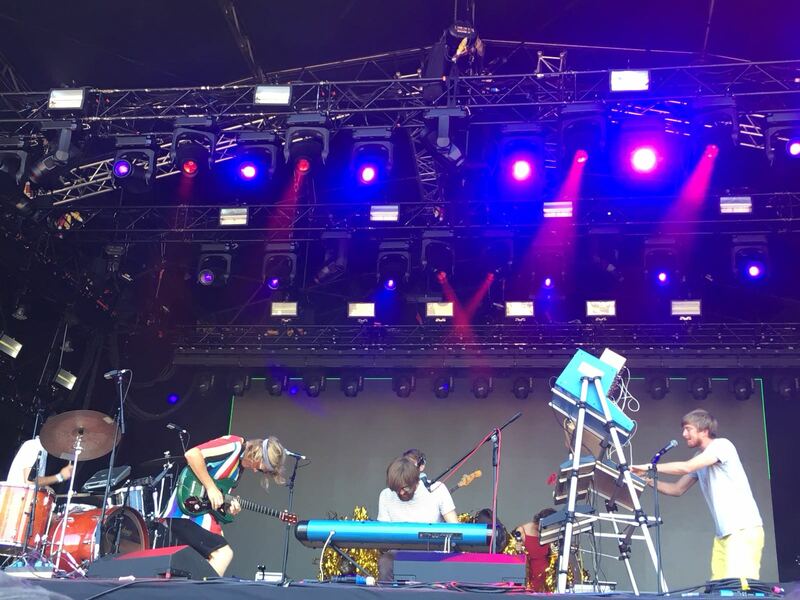 She took the opportunity to film footage for a new music video so the crowd were all too willing to oblige in bringing some energy and hype, throwing toothbrushes up on stage to her hit song Queen’s Speech (Brush yo’ teeth). Peter Hook and The Light brought a mixed crowd to the main stage; the audience really got going to the bigger hits of Joy Division and New Order, it was one big singalong and the rain finally laid off. A barefoot and glowing Mike Love played an outstanding set at Chai Wallah, with his passionate reggae songs of peace and love; he drew a relaxed crowd and a small but devoted dance floor, his vocals were performed to perfection and ideal for a mellow Sunday. After telling us of his 16 hour journey to get there, he was incredibly sweet inviting the audience to come and speak with him afterwards. Chai Wallah also provided us with a real sweet treat of Irish Cream hot chocolate, a perfect warmer to set us up for the evening ahead. The Libertines pulled a massive crowd to the main stage, showing lots of comadre onstage and I sensed a collective sigh of relief at Pete Docherty’s relative sobriety and ability. Back at camp we enjoyed the impressive fireworks display which included brightly coloured smiley faces and heart shapes! There was massive queues to get into the Glow tent for Basement Jaxx that night, but it was well worth the wait, and we had a really good dance, before heading back to the woodland area for a sit by the fire pits. We had one last ride on the Waveswinger before a late night pizza feast and then snuggled down with friends back at camp for a much needed sleep. Wet and wild weather can turn any festival into an endurance test, but Kendal Calling proved to keep the good times rolling and spirits were barely dampened, although many a shoe was! Once again I came away from a festival with a bunch of new friends, feeling closer to older ones, and enriched from the whole experience. Kendal Calling is wilder than the deer who call it home, and though it’s not yet as old and wise as the beautiful trees growing throughout its landscape, it is a hedonistic, hectic outdoor funhouse that will keep calling party goers back for many years to come.